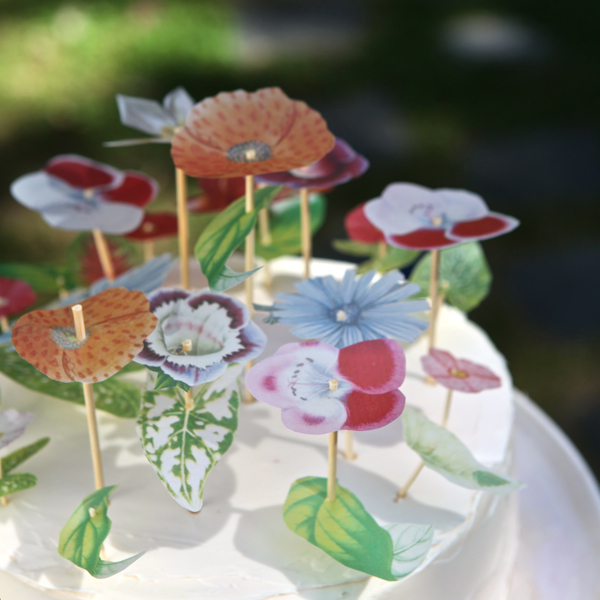 I’ve always loved the way edible flowers – or frosted, or gum paste, or marzipan for that matter – look on a cake. But there are always these two problems for me- I’m afraid I’m going to inadvertently poison my guests, and they’re not always readily available (I think I’ve seen packages at Whole Foods, but that was eons ago). 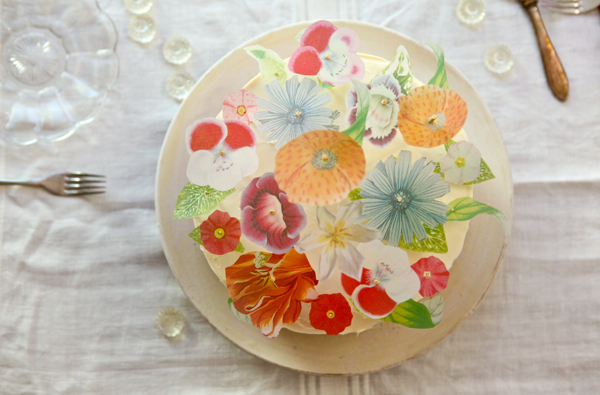 This is a pretty simple way to decorate a cake inspired by that look. I printed out vintage flower illustrations (found copyright-free here), cut them out, stuck them on toothpicks and skewers, and voila! A pretty cake! The genius of it is you can pick and choose your flowers, colors, leaves, etc to create whatever you wish– I’m pretty sure there’s no way those leaves I used would go with the flowers I used. Artistic license! Materials needed: vellum, scissors, toothpicks, and wooden skewers. Step 1: Choose your flowers and print them out on vellum paper (I found a package of 50 sheets at my local office supply store). Look for ‘overhead’ or ‘bird’s-eye view’ flowers, since a picture of the side of a flower won’t work as well. 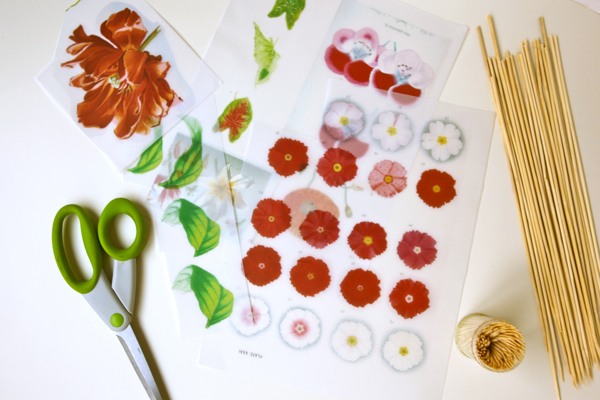 Step 2: Carefully cut out the flowers. Always cut just inside the edge so no white is showing. Step 3: Snip off one tip of the toothpick (leaving one side pointy) and cut down a few skewers to about 4-6 inches (again, leave the pointy side pointy). 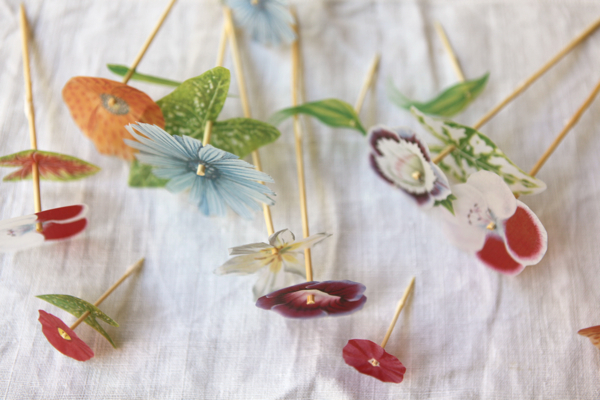 Step 4: Take the sharp edge of your toothpick or skewer and pierce the center of the flower. You can add a leaf if you want to the same stick, or just leave it a single flower. Step 5: Arrange your sticks in the cake with the tallest in the center, shortest around the edges. Beautiful!!! I, too, am a bid fan of printing my own but, I’ve never done so on vellum. I love it! You are too too clever Miss! So cute and clever! Love your blot. Such a clever and very unique idea! 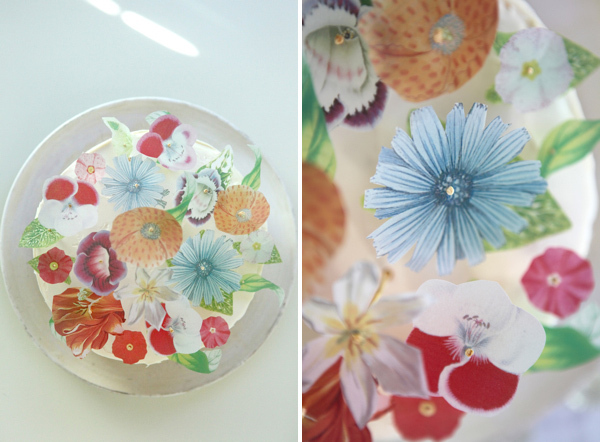 You could even print out the same flower multiple times and layer it to give it a more 3D effect. Too pretty! Wow. These are really really beautiful. This is fantastic! I can’t wait to try this out! love love love!! This is such a great idea to dress up a cake. Great design! How cute are these! Thank you for the inspiration! Wow, I love crafts that are EASY and beautiful. I am so doing this for my daughters birthday party this weekend. What a beautiful idea! So easy for anyone to do to. Thank you for sharing. 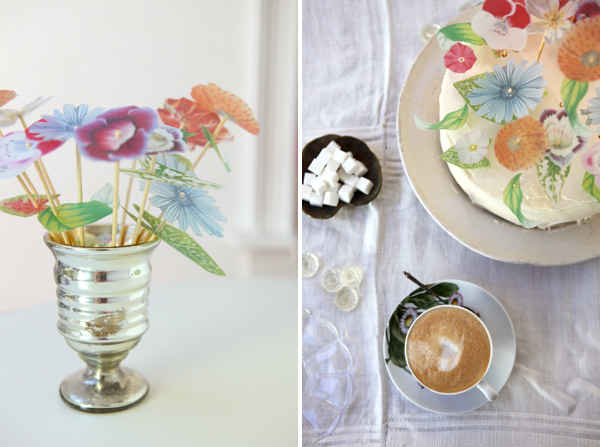 These are absolutely gorgeous – so simple and I love the fact that they are non-edible. Much better! I will have to try this for sure. Such a lovely idea, absolutely beautiful. Wow! I love the combination of vintage images with the vellum. I can’t wait to try this for upcoming baby shower cakes! I also want to give a shout out to your site which I ADORE. Keep going! Love these!!! I,m not sure we can get the same vellums in the uk, but there must be creative ways of making your own… Fab project! this is such a clever idea! I love the look of the flowers on the vellum paper – that was a nice touch. So so SO in love with this idea! Way to make your own dreams come true, sister! Love it, so unique and so simple! Wow this is so beautiful yet so easy! Great idea! Absolutely love this blog! Beautiful! Pretty photos and ideas. Friday Things : Yes, I want cake.